Oh, that looks so pretty. I can't believe that it's only one strand of floss. I pulled mine out the other day (one of those crazy challenges from last year) and then put it away again. Maybe I should pull it out and take a further look. so pretty, love these colors!! Jen's piece really is gorgeous!!!! Love your new start. I really, really want to get mine back out. It's lovely! The colours are just popping off the fabric. Looks great Nicole!! 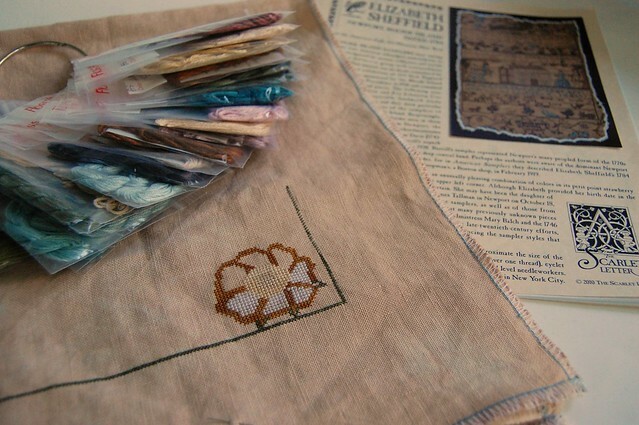 Can't wait to watch your progress as you stitch on it, such a great sampler! It looks absolutely lovely - kudos to you for daring to start it all over again. Oh my gosh. Beautiful!!! Now I gotta copy you, lol!! So pretty, can't wait to watch your progress!! Ack!!! Gorgeous! Absolutely gorgeous! The 35ct is a good idea too with all the over one. :D Sigh. Love it! Beautiful colors! 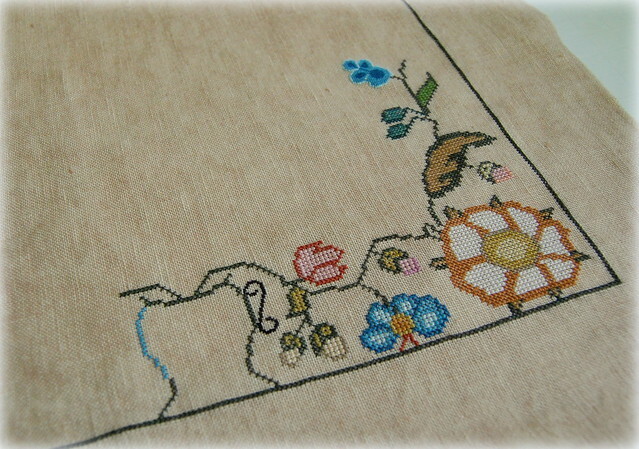 I have never stitched with one thread of cotton, only with silk. It looks beautiful and it will be fun seeing your progress. Sometimes you just have to play with bright colors! I use one strand on 35/36 linen all the time. "Elizabeth" looks lovely already, Nicole! You would never know you are using just one strand. Your stitching is always beautiful. Look forward to watching your progress! 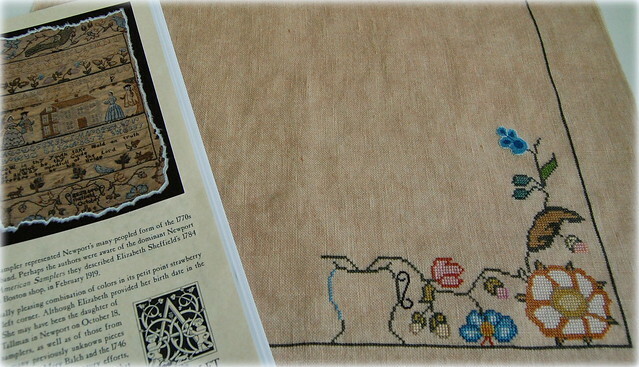 I love this sampler! Those parrots just slay me. Gorgeous! I've just found your lovely blog. Your WIP is just beautiful! Ack!! It's so pretty. LOVE the new start, Nicole--though I thought your first start was pretty special, too. Very pretty Nicole. It looks very delicate. I have found myself wanting to use more cottons than silks lately. I think I'm a cyclic stitcher when it comes to fibers. Both of your starts were beautiful, but the dmc do seem to be brighter. quel courage de tout recommencer ! I love the new version of your sampler. Time is never lost when you're happy with the result. Liking Elizabeth 2.0, the colours are very pretty. Nicole, both versions are beautiful, but I am with you on the DMC. The bright colors look great! Gorgeous!!! It really says a lot for plain old DMC, doesn't it? Beautiful! So what exactly are you doing differently...using DMC instead of overdoes, or what? It does look great. I just started my BBD Christmas Garden over on lighter fabric and stitching it over one thread, and I am in love with my 2.0 version now, so I can relate. Well, seeing the two together, I have to admit that I love version 2.0. Great colors so far!! And given that you like it better, you'll probably find yourself looking forward to working on it more. Happy stitching! I have to quit blogging. Its too enabling. This is gorgeous! I want it!